As the two iconic battling moose towered above, Dennis Riedhammer chiseled mortar away from the sculpture’s base, one rock at a time. 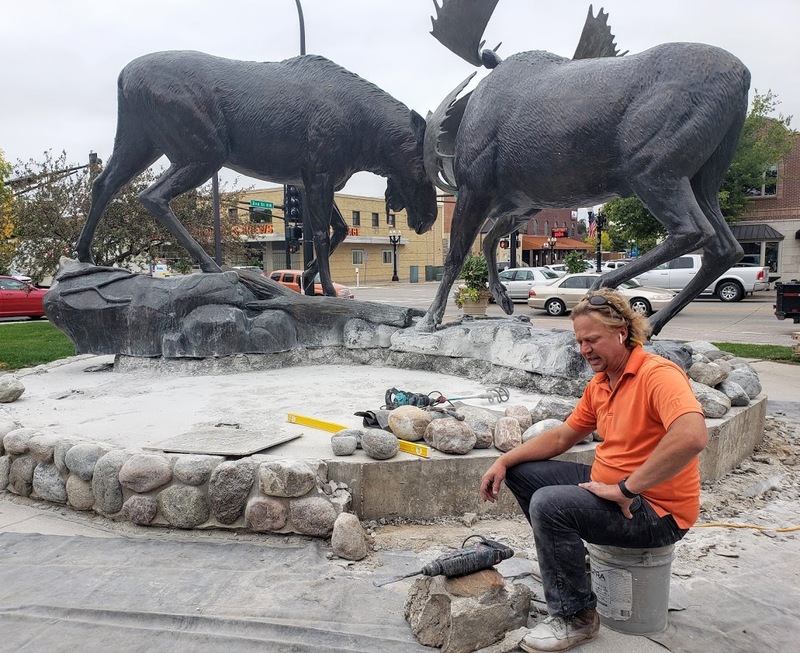 Riedhammer’s job this week is just one part of a process to restore the base of the bronze sculpture in East Grand Forks, Minn., which contained a serious design flaw. Dennis Riedhammer chisels away mortar from the base of an iconic sculpture of two battling moose outside Cabela’s In East Grand Forks, Minn. Originally, the base had a lichen cover that allowed water to penetrate the concrete, Riedhammer said. Minnesota’s summer and winter temps ate the concrete and it did what concrete does in Minnesota: expand and contract and erode. “It was probably designed down south,” Riedhammer joked. Riedhammer hopes to complete his part of the job by week’s end. Then the concrete crew arrives to finish its mission of pouring, stamping and staining the new concrete base. Bass Pro, a privately held company, bought 82 Cabela’s stores a year ago for $5 billion. The East Grand Forks store at 210 Demers Avenue, all 60,000 square feet of it, was one of them.